Father James Gibbons was ordained in 1853, and in 1886, as Bishop of Baltimore, he became the second American Cardinal. He was a leading figure in the American church and had this statement written and circulated to the bishops of America in 1921. 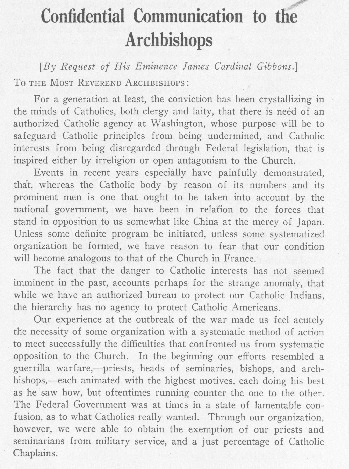 Bishop William Russell, a Baltimore native who was Bishop of South Carolina from 1917-1927 and was a member of the original National Catholic War Council, wrote this at Cardinal Gibbons' request. In it the need for an organization to represent Catholic values and concerns to the federal government was expressed. The position of the church in America was compared to that of France where it was controlled by the state. Define guerilla warfare. How was the effort of the American Catholic Church to protect its members like guerilla warfare? Ultimately, this communication addresses the need to establish a new organization. What would be the purpose of this organization? Who might belong? Why do you think Cardinal Gibbons would want this communication to be confidential? Describe how this communication might be related to the Compulsory Education Bill. How could the organization discussed here help the Catholics of Oregon? ← Margaret Meyers, "The Ku Klux Klan in LeGrande, Oregon, 1918-1924"